So we've had the most snow for 18 years and I thought a walk around the paths and roads at Digley would give the opportunity for some good photographs. From the Northside Car Park I decided to walk across the dam wall towards the South Car Park and then along the Southside path to Bilberry. 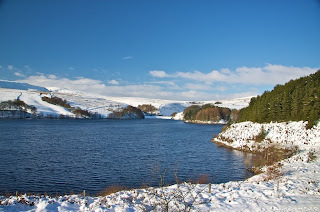 This first photo is looking up Digley reservoir with Bilberry dam wall in the distance. Along the path the fields were covered with snow and at this particular field the snow was very bumpy. 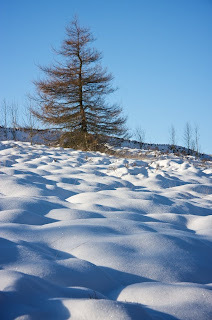 I like the way that this photograph has the texture of the shadows in the snow in the foreground and the fir tree at the top. From here we walked down to Bilberry Reservoir which was completely frozen over. Unfortunately while I was swapping lenses I dropped my lens into the deep snow and it got completely wet through. I tried to dry it out but I found when I downloaded the next 50 photos that they were all blurred because of condensation inside the lens. Later I had another try at drying the lens out and then after that the photographs were better again. Here's Evey climbing out of the deep snow on the path and into the field where the snow was much less deep. 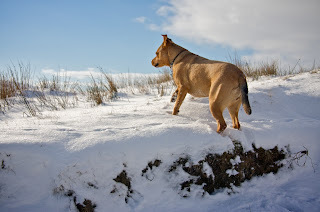 Soon after I joined her when the snow drift in the path was up to my thigh and making wallking very difficult. There are a few old quarries around Digley where I guess they took the stone for all the drystone walls, buildings and maybe the reservoirs too. 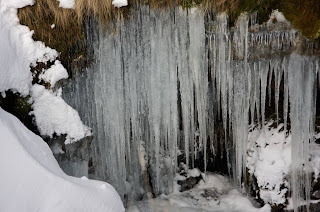 We walked into one of the quarries and found these massive icicles inside. It wasn't possible to get down near them but I would think they were about 6 to 8 feet high and very impressive. 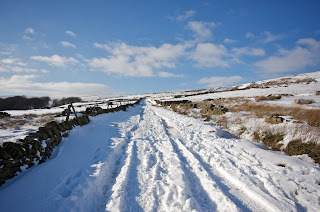 The old roads were very deep with snow and the farmers had left tyre tracks where they had driven their vehicles around the fields. There are more photos from this walk in the album on my gallery website and I may add some more photos later as I took quite a few (about 300). Have a look around and let me know what you think. 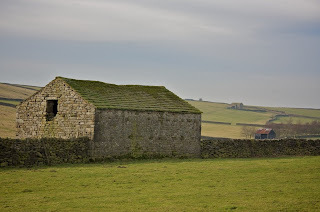 Evey and I got up early to go to the Yorkshire Dales for a long walk and take some photographs. I hadn't decided exactly where I was going to go but decided to drive up the valley from Bolton Abbey until I felt inspired. We ended up parking at Grassington at about 7:30. It was still a bit dark and the tourist office wasn't open to get some ideas for routes so we just headed down the river towards Burnsall. There are more photos in my gallery but here are a few to get you started. A little way down was the stepping stones across the river to Linton Church. The water level was a bit too high to cross so took this photo instead. 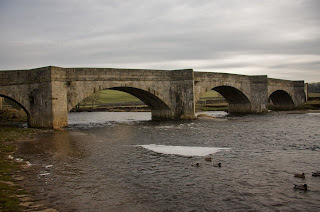 There wasn't much else to photograph on the river except for a cove just befire Burnsall and then Burnsall Bridge. I took a better photo of the cove on the way back. After Burnsall we carried on to Appletreewick and then climbed up the hill to a place called Bibble Bridge. 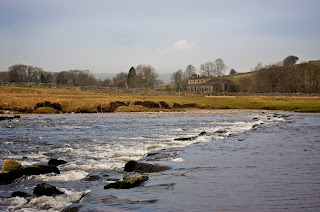 From there we took a different route that took us past some old barns and then back down the hill to Burnsall. 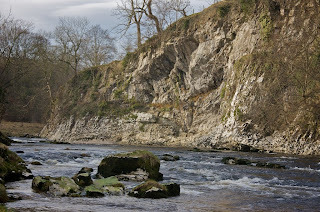 Took more photographs of the cove on the way back to Grassington. 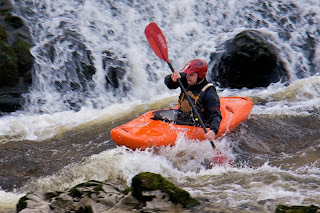 When we reached Grassington there were some canoeists going down the rapids and under the bridge.